Emil Zatopek was a Czechoslovak athlete who won three gold medals at the 1952 Helsinki Olympics (5,000m, 10,000m and marathon). He was noted for his relentless training regime which involved a pioneering use of interval training. A hero in his native Czechoslovakia he was an influential member in the Communist Party, however, he was later expelled for supporting the democratic movement of 1968 and as a consequence was forced to work in dangerous mining jobs. He was rehabilitated in 1990 by Czech President Václav Havel. Zatopek is considered one of the greatest athletes and sporting personalities of the Twentieth Century. Emil Zatopek was born in Czechoslovakia in 1922. His working-class parents, Frantisek and Anzeka had eight children in all. The large family meant family finances were spread thinly and Emil was always conscious of living close to the poverty line. As a child, Zatopek was a bright, independently minded spirit, with an unusual power of memory. Many friends said an abiding characteristic of the young Zatopek was his willingness to try everything differently. In 1937, just short of his 15th birthday, Zatopek left his hometown to work in the large Bata factory in Zlin. For the time, it was a reasonable job, though very disciplined and somewhat repetitive. Aged 18, he had no interest in running but on one occasion was picked by his company to join a race. Despite his protestations that he was unfit, he was forced to start the race and ended up coming second out of 100. This began his interest in running, and within four years he was representing Czechoslovakia. The second world war and the German occupation of Czechoslovakia meant he lost some of the best years of his career. But, during the war, he was able to persevere with his training and make significant improvements. After the Second World War, he joined the new Czechoslovakia army, who were sympathetic to allowing him time to train – especially as international success followed. In 1948, he became a household name winning the 10 km in the austerity London Olympics. He also finished second in the 5 km, though many felt that running with greater reserve in the heats may have enabled him to win. Their marriage was largely happy, though to Emil’s disappointment remained childless. After the 1948 Olympics, Zatopek’s dominance of middle-distance running grew – leading to several world records. On 29 September 1951, Emil Zatopek became the first person to run 20 kilometres in under one hour and broke four world records in one breathtaking race. By the end of 1953, he held eight world running records—the only man in history to hold so many records at the same time. In total, he set 18 world records. In 1952, Emil Zatopek achieved one of the greatest Olympic feats of all time – something that will probably never be reproduced. He won gold in the 5km, 10km and then at the last moment decided to run his first ever marathon. Despite no previous experience at the distance, he won the race by over two minutes. This triple Olympic gold remains an unprecedented achievement. The amazing feature of this Olympics was that two months before the Olympics, doctors advised him not to race because of an infected gland. Zatopek ignored the doctors’ advice. Another incident shortly before the 1952 Olympics also illustrates Zatopek’s willingness to take an unorthodox stance. In 1952, Czechoslovakia was in the throes of great political oppression, with many people put in jail and executed for ‘suspect’ political views. Stalinist purges were widespread and even athletics was not immune. Just eight months prior, the entire national ice hockey team were arrested and eight players sentenced to a total of 77 years – their crimes were supposedly contemplating defection. Zatopek’s stance was brave and perhaps foolhardy, as the consequences could have been severe. It was also remarkable given what was at stake for Zatopek and he was widely tipped to be favourite for at least two Olympic golds. In the end, the Ministry of Sports climbed down and allowed both Standa and Zatopek to travel. However, a dossier was made on Zatopek for his possible punishment after the games. It was with this threat hanging over his head, that Zatopek competed in the Olympics. His unique triple of Olympic golds gave Zatopek a public popularity which saved him from further punishment, a lesser athlete would probably have fared very differently. Zatopek was not just an Olympic champion, but a gregarious character who spontaneously built up relationships and goodwill with athletes from other countries. 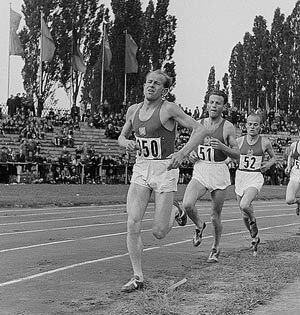 In the 1952 Helsinki Olympics, it was Zatopek who embodied the Olympic ideal – often allowing westerners into the separate Warsaw Pact Olympic accommodation. To Zatopek, the Olympics was significant for its ideals of international friendship. He learnt to speak several languages and easily struck up conversations with people from around the world. He had a deeply generous spirit – frequently helping out strangers or people who came to see him in his Prague flat. Emil Zatopek threw everything into his running and this was reflected in his agonising facial expressions. His running style was often criticised for being gangly, inefficient and unattractive, but Zatopek retorted you don’t win any prizes for looks in a running race. He ignored his critics and retained his unique style throughout his career. At the time, this challenged conventional training wisdom. Zatopek remarked on the issue of interval training. As he grew in international stature, Zatopek was used as a spokesperson for the Communist regime. His working-class roots and sporting prowess made him a useful spokesperson. 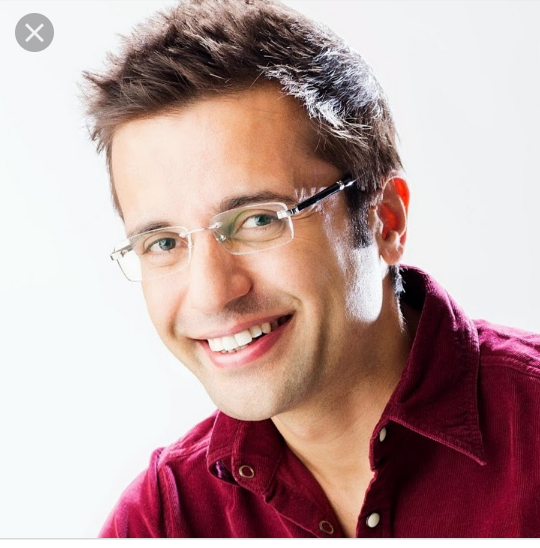 He was also a gifted speaker who had a capacity to connect with the audience. Though he mostly stayed off politics, he did believe in socialism and communism and later joined the Communist Party. However, he did increasingly become aware of some failings of the Communist regime. In the Prague spring of 1968, Zatopek spoke out for the democratic wing who were calling for greater change and freedom from the Kremlin. Zatopek had tremendous loyalty to Alexander Dubcek, the leader of the democratic wing who opposed the Russian invasion. When the revolution failed, and the Soviet hardliners reasserted control, Zatopek was punished for his enthusiastic support of the Prague Spring. He was expelled from the army and Communist Party. He lost the comfort of his former life and for several years had to work in a mine. International travel and national acclaim dried up completely. Zatopek was now suspect. Post-1968 was a difficult time for Zatopek with pressure put on him to fore-sake his former ‘democratic views’. Slowly he was somewhat rehabilitated by the regime after learning to be more circumspect in expressing political views. By the mid-1970s, he was able to travel again, representing Czechoslovakia at international sporting events. “I do know no-one cherishes any gift more than I do, my only Olympic gold medal, and not because of what it is, but because of the man whose spirit it represents”. Zatopek passed away aged 78 in Prague, 2000. He had lived to see the overthrow of the repressive Communist regime and left a profound legacy of athletic achievement.